Aid has finally reached the Rukban camp in southeast Syria, where about 50,000 displaced Syrians have been effectively besieged for months. 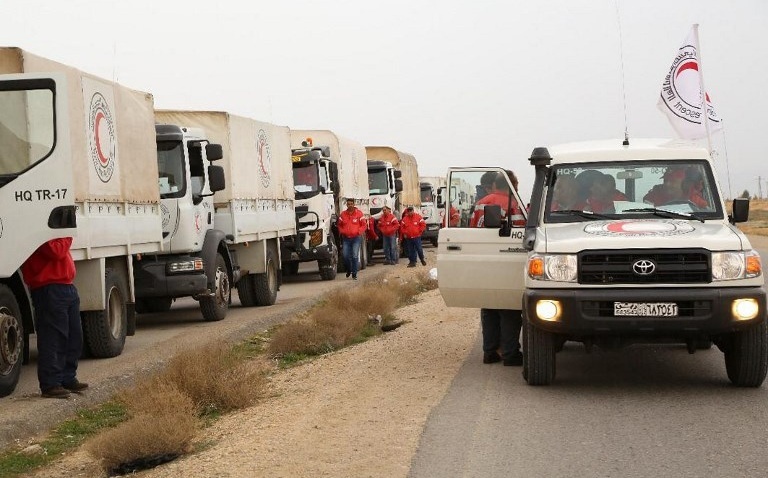 A convoy of 133 trucks of the UN and the Syrian Arab Red Crescent reached a distribution center in the camp, near the Jordanian border, on Wednesday evening. Supplies included food, hygiene products, winter coats, sleeping bags, and blankets. The convoy is only the second allowed by the Assad regime into the camp in a year. Regime forces have cut off the main route into Rukban, used by Bedouin traders, and Jordan — which cut off movement across the border in summer 2016, following an Islamic State suicide bombing — has not allowed supplies across the frontier. The UN says thousands of people, particularly children, are at risk from shortages of food, medicine and supplies, with the situation exacerbated by harsh winter conditions in the barren area. Medics say tens of residents have died from lack of adequate nutrition and care in recent months. The regime has been pressing residents to return to their homes, which many fled in 2015 amid ISIS attacks. But those in the camp say they fear detentions and forced conscription and are uncertain about the status of their property. In January, about 200 residents left in trucks for their homes in Maheen in Homs Province. Homsi explained that “only the elderly, those over the [military] reserves age, and women” can risk a return. He said “most of the young men” would rather go to opposition-held territory in northwest Syria, but the smuggling route is “very dangerous and costly”. Russia has tried to turn the blame on the US, saying Rukban is within a 55-km (34-mile) exclusion zone around the American base at Tanf near the Jordanian and Iraqi borders. Residents have expressed fear that a US withdrawal, ordered by Donald Trump in December, puts them at risk from pro-Assad forces. An “official Jordanian source” said Jordan, Russia, and the US are continuing talks in Amman about the dismantling of the camp before US troops leave the Tanf base. PreviousCan the UN Save a Peace Process in Yemen?